There are three points. First, nitrous oxide is comprised of 2 parts nitrogen and one part oxygen (36% oxygen by weight). When the nitrous oxide is heated to approximately 572oF (on compression stroke), it breaks down and release extra oxygen, However, it is not this oxygen alone which creates additional power, but the ability of this oxygen to burn more fuel. By burning more fuel, higher cylinder pressures are created and this is where most of the additional power is realized. Secondly, as pressurized nitrous oxide is injected into the intake manifold, it changes from a liquid to a gas (boils). This boiling affect reduces the temperature of the nitrous to a minus .127 Degrees F. This "cooling affect" in turn significantly reduces intake charge temperatures by approximately 60-75 Degrees F. This also helps create additional power. A general rule of thumb: For every 10 Degrees F. reduction in intake charge temperature, a 1% increase in power will be realized. Example: A 350 HP engine with an intake temperature drop of 70 Degrees F, would gain approximately 25 HP on the cooling affect alone. 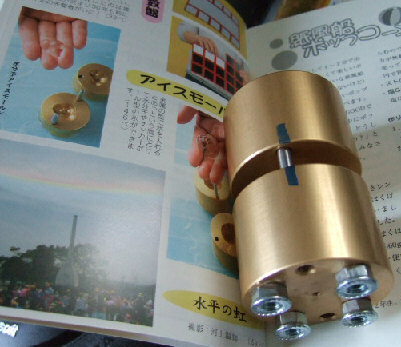 The third point, the nitrogen that was also released during the compression stroke performs an important role. Nitrogen acts to "buff or dampen" the increased cylinder pressures leading to a controlled combustion process. Through years of involvement with all forms of high performance racing, NOS has evolved into the world's largest manufacturer of performance nitrous systems. NOS designs and engineers nitrous systems for virtually anything with an internal combustion engine from stock to highly modified cars, motorcycles, watercraft, aircraft and even snowmobiles. NOS has become synonymous with quality high performance automotive products. Research and development, engineering and technical support assure you of being part of the winning NOS team. N2O, or Nitrous Oxide, also known as laughing gas, is a weak anaesthetic gas that has been in use since the late 18th century. Common use includes both surgical and recreational purposes. Most people have experienced nitrous in the context of dentistry. Nitrous is also used in the dairy industry as a mixing and foaming agent as it is non-flammable, bacteriostatic (stops bacteria from growing) and leaves no taste or odour. 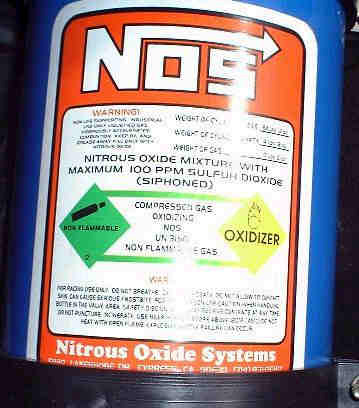 Nitrous is also used in auto racing to speed engines. 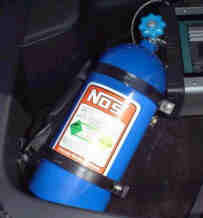 Nitrous is even used in diving to prepare divers for nitrous-like effects.